One of the indicators that your property has a problem with damp may be that you start to see mould appearing. The spores that cause mould to grow are in the atmosphere, but they don’t cause an issue unless they come into contact with a damp surface where they can grow. 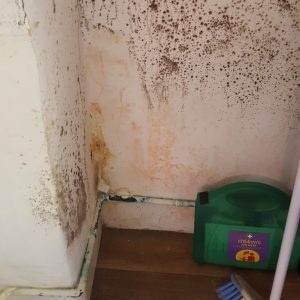 Damp and mould are both caused by excess moisture within the property, which can have a variety of causes such as leaking pipes, rising damp, leaking rain water goods or condensation. In the case of penetrating damp (e.g. damaged pipes or leaking gutters), it is important to fix the defective equipment as soon as possible to prevent further damage. 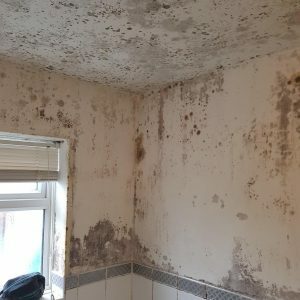 If you suspect that the mould may relate to rising damp or condensation, it is important to contact a reputable damp specialist so that a qualified Surveyor can come out to your property and give you advice as to appropriate solutions. They may suggest installation of a chemical damp proof course to combat rising damp or an extract unit or Positive Input Ventilation Unit (PIV) to combat condensation issues. Extract units remove the moisture in the air at source (e.g. in the bathroom or kitchen where there is steam from washing and cooking) whereas PIV units filter fresh air into the property whilst removing excess water within the property. By removing the moisture, you reduce the condensation issue and without the excess moisture on walls further mould growth will be prevented. As soon as you have tackled the source of the moisture issue you can look at having the mould removed. If you decide to do this yourself, then it is worth taking a look at the NHS website where they give you best practice advice.